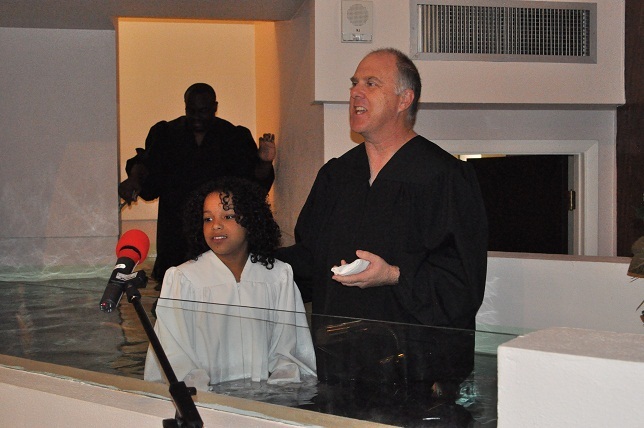 If all the angels rejoice when one soul gives their life to Jesus, and they do, then all the angels must have been downright ecstatic this morning at the Tampa First Seventh-day Adventist Church, when an entire family of three each gave their life to Jesus in baptism. Please join us and the angels in rejoicing as you enjoy the pictures and stories. Several months ago, Marian showed up in my Seeker’s Sabbath School class. She told me she was raised Episcopalian, but wanted to learn more about the Seventh-day Adventist Church. 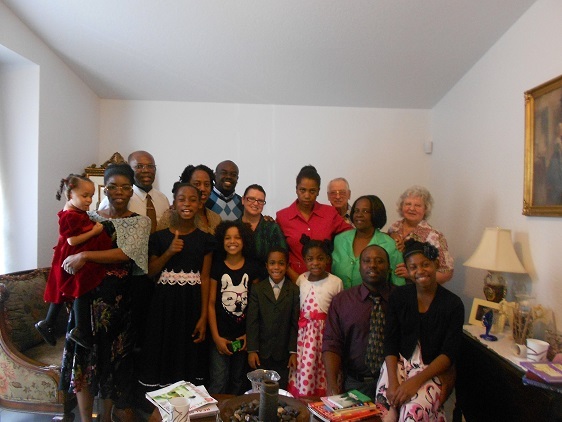 Her husband, Mark, had been an Adventist and lot of his family still are. 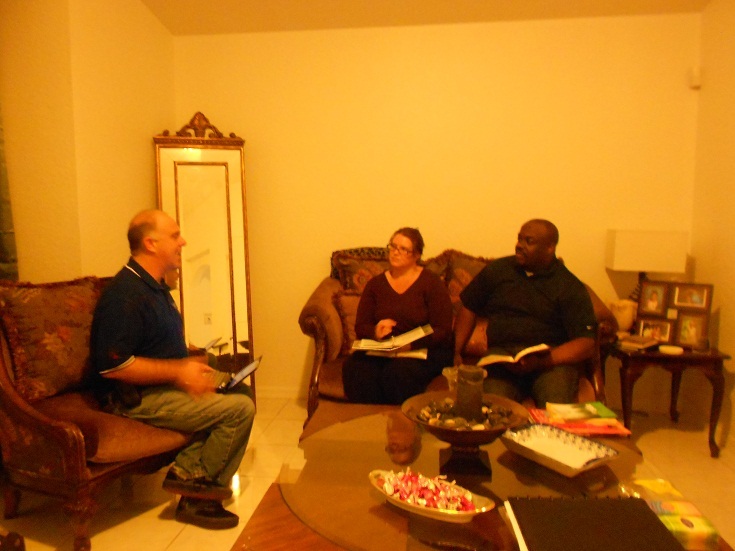 Mark and Marian joined my Seeker’s Sabbath School class, and we began personal Bible studies in their home. Mark and Marian live just down the road from me, so it has been great not only making new friends at church but also making new friends in the neighborhood. 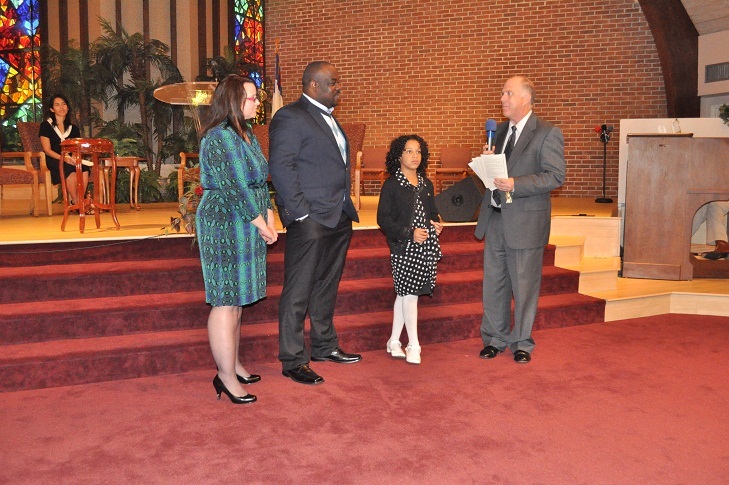 Mark and Marian placed their daughter, Cecilia in our church school at Tampa Adventist Academy this fall while they were still studying for baptism. Cecilia loves her new teacher, Mrs. Nowotny. Cecilia says Mrs. Nowotny really listens to her. Cecilia decided she wanted to be baptized and I began studying with her too. Cecilia has been enjoying the chapels at TAA and even joined our Wednesday after school Bible study group. Apparently, not only does Mrs. Nowotny really listen to Cecelia, but Cecilia listens as well, as during our Bible study time, she shared with me things she had learned about Jesus from Mrs. Nowotny. “Being baptized and growing up in the Episcopal church provided me with the foundational beliefs in the blessed Trinity and guidance to walk a path of Christian living. I was blessed to have the opportunity to attend a faith-based college, and while attending, I was fortunate to volunteer and lead the adult choir in a Presbyterian church. Throughout my adulthood, I desired to deepen my faith and searched for the right fit. After my daughter Cecilia was born, this became more important to me than ever before. I remembered that when Cecilia was blessed in the Seventh Day Adventist church how much joy we were surrounded with and the warmness our family received. We attended several other churches of different denominations and nothing seemed to fill me with the joy I had once experienced. Last spring, I decided to go online and research the Seventh Day Adventist faith and beliefs, I researched the school curriculum and found that it enhanced upon my foundational beliefs and was completely bible based. I researched all of the area churches and found Tampa First to be the church that I felt a connection with and we planned to attend. I then contacted the Tampa Adventist Academy and scheduled an appointment for Cecilia to be interviewed and tested for acceptance into the school. I feel so blessed that my first experience at Tampa First was surrounded by so many generous members eager to help our family settle in. I met William on our very first visit and it changed me. 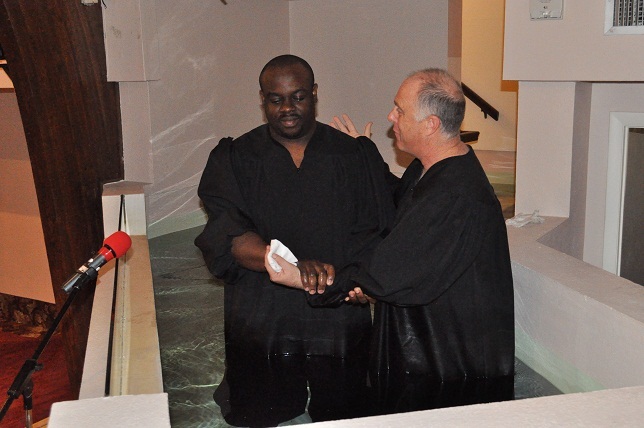 Soon after, William was studying with Mark and I in our home and my path was clear, I wanted to be baptized, follow God’s laws and be reborn to self to honor the Lord for all his grace and glory for the things he had done and given up for me. Toward the end of our baptismal sessions, our daughter, Cecilia, brought forth a very good argument on why she should be baptized. William so graciously changed course and began studying with Cecilia as well. I am so glad we delayed our fall plans to include Cecilia in our baptism. 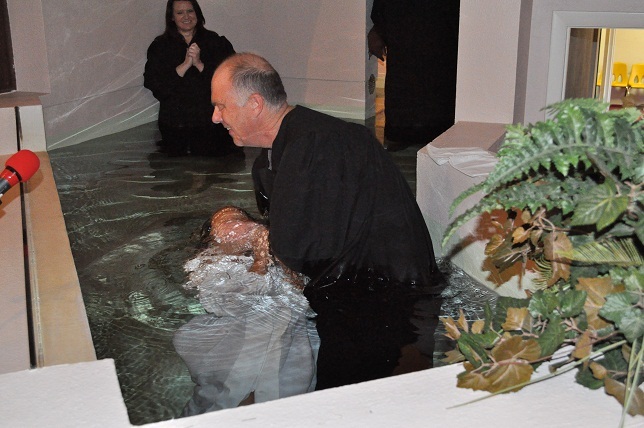 Today, January 12, 2013 I have been baptized with my daughter and husband and I cannot thank William enough for bringing his knowledge and the power of the Holy Spirit into our home and family to bring us to a closer walk with God our Father. Pastor Brad has become a very dear part of our family by providing us with his time and guidance and I thank him for his deep dedication to our family and continued support. I pray that the peace of the Holy Spirit remain with each of us always and thank each of the members at Tampa First and our families for being such an integral part of our journey to walk into baptism and may we continue to walk in Christ from this day forward. If I stumble a time or two, I believe my roots are planted through baptism and God’s love will carry me through the storm to meet each of you in the air on that great day of rejoicing. Cecilia describes baptism by saying: “The water surrounds us with God’s love and holds us.” I had never thought of that before, and thought it was a very beautiful analogy. I always like to pray for the person being baptized and for them to always remember the amazing love that brought them to this decision. Mark is a really cool dad. When most parents come by to pick their kids up after school during our Bible study, they take their kids and go. That is totally understandable as this is an informal after school study, and the parents have things to do and places to go. 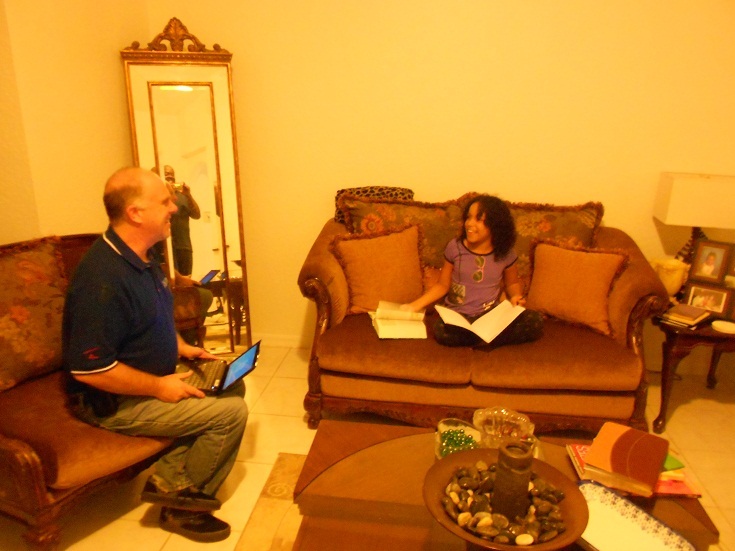 However, when Mark comes to pick up Cecilia, instead of taking her out of the Bible study, he stays and joins her and the rest of the kids in our study group. It makes Cecilia proud to have her dad there, and the other kids like it too. After church Mark, Marian and Cecilia invited me and their family over to the house for lunch as we celebrated a totally awesome Sabbath! 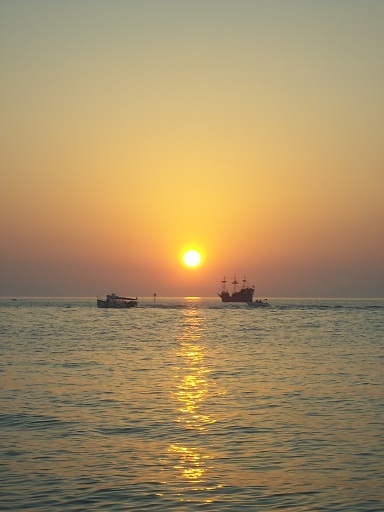 Please don’t let the sun set on you before you give your life to the one who died to redeem you with his precious blood. 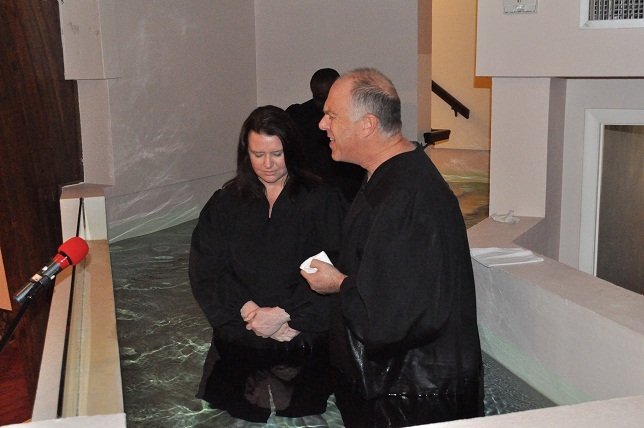 We are planning another baptism at Tampa First February 23rd, if you feel the Holy Spirit tugging on your heart, I would love to visit with you about that date or another upcoming date. You can contact me at LayPastor@TampaAdventist.net . If you are not in the Tampa Bay area, I would still love to hear from you so I can introduce you to a church family in your area who can help you with this important step. What a wonderful day for you, this family and for the ever praising angels who surrounded you there. The Holy Spirit, Jesus and the Father also have joy in their hearts as they see people accepting them into their hearts. Thank you William for using your gifts to bring glory to God. Oh my! What a joy to have those three new members in the family and especially Cecilia! Thank you for all the time you have spent with them. I am overwhelmed!